Based on: A love for exotic, foreign adventures from America, and the perfect adaptation of a genre to a platform. I was nine years old when I first learned of Dungeons and Dragons. In this game, players were given the opportunity to take on the role of a fantasy adventurer and explore ancient ruins, dungeons full of hideous creatures, and towns on the frontier of civilization. More important than the theme was the playstyle -- it was completely open. You could choose with fine granularity how your character reacted to every situation. It wasn't just about combat; it was also about avoiding traps, solving puzzles, exploring, and diplomacy. You could truly take on any role you wanted. I remember visiting a friend's house and reading through a D&D book he had. The detailed descriptions of the behavior and physiology of gray oozes and gelatinous cubes sparked my imagination. But not knowing anyone who actually ran these fabled games of Dungeons and Dragons, I looked toward the computer to simulate the experience. I found there were plenty of these role-playing games for the computer that aimed to replicate the D&D experience. The problem was that they were far beyond what my young mind could comprehend. Playing The Bard's Tale? was pure frustration as party after party died. A friend and I attempted to puzzle through Might And Magic?, but soon found ourselves completely lost. When I was as young as six, I had been intrigued by these games and thought that they would be perfect for me. Yet by age ten, I still hadn't found a single one that I truly got. Then Dragon Warrior arrived. Being a loyal Nintendo customer, and thus a Nintendo Power subscriber, I couldn't miss its release. The hype with which the magazine built it up caused me to beg my parents for it as soon as it came out. Upon seeing its commercial, my mother understood why I wanted the game so much: it made you believe that you were a warrior of destiny. The NES certainly had its share of games with a swords and sorcery setting, and indeed one could argue that Zelda? already possessed many of the characteristics that Dragon Warrior claimed -- but Dragon Warrior was different in many different ways. One can't overlook the significance of using text to represent the major points of the game. The text sparked my imagination, much in the same way that a book stimulates the mind in ways a movie cannot. While at its base, Dragon Warrior's fights boil down to a series of numbers, my mind filled in those messages with scenes from each encounter. The battles in Zelda were far less abstract, and thus Link missing the Darknut with his sword failed to inspire me in the same way. Moreover, the fact that I had to be conscious of moving Link around and slashing his sword never let me forgot that I was a game player controlling Link's (limited) set of movements. While Dragon Warrior's move set was just as limited as Zelda's -- if not moreso -- choosing an abstract "Attack" command from a menu left far more room for imagining what was happening in the battle. I felt like I was truly getting into the mind of the hero of the game. Dragon Warrior also offered up a great sense of exploration. This is due in part to its huge variety of detailed enemies. Artist Akira Toriyama's designs made each new creature that I encountered take on a life of its own. Furthermore, the constantly-scrolling countryside and dungeons meant there was always something around the next corner. Dragon Warrior's final immersive offering is, perhaps, its simplest: the process of gaining levels. One thing that helps me to become personally invested in a character is to improve him. The fact that I could see that my character was getting a little better after each battle and that, at certain points, my statistics could increase (and I could possibly learn a new spell!) was compelling. Indeed, this compulsion to improve characters, often by grinding for experience, has been at the heart of most computer RPGs since the earliest days. Improving your character by simply finding new items (as in Zelda) gives a similar sense of accomplishment, but lacks the feeling of personal improvement granted by each level up. Of course, by the time Dragon Warrior was released on American shores, computer RPGs had been doing all these things for years. But Yuji Horii and the rest of the Dragon Quest team didn't think that the computer RPGs of the time would be successful on the NES (and Pony Canyon's shoddy NES ports of the Ultima? and SSI Gold Box games seem to bear that feeling out). They knew the majority of console gamers were not as old or sophisticated as those who played Wizardry? and Ultima on the computer, and that consoles were more limited than PCs, so they distilled the genre's mechanics down to something that was easier to comprehend. Moving your character around was simple. Battles consisted of one-on-one fights with only four possible commands. There was only one playable character. Despite these simplifications, they managed to keep all of the things above that make RPGs engaging. Additionally, they made sure to ape the greatest strength of the early Ultima games: vast lands of interconnected towns and people. This gave a sense of being in a real world and helped remind you of the narrative interleaved throughout the game. Unlike some computer RPGs of its time, Dragon Warrior was very good at nudging you in the right direction and letting you know what you should do next, even if the world was open and you could do it in a different order if you wanted. 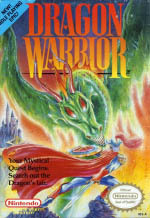 Dragon Warrior was created as an introduction to RPGs for those who had not played them before, and (at least in Japan) it worked phenomenally. It became an insanely popular franchise. It may not have worked quite as well in the U.S., but it did work on me. After playing Dragon Warrior, I was hooked. And ready to take on those formerly impenetrable worlds of The Bard's Tale and Might and Magic. Dragon Warrior was truly a gateway to another world of gaming.